Do you think you have what it takes to become a case manager? Take a look at skill set checklist below to see if you have the traits needed to succeed in this industry. 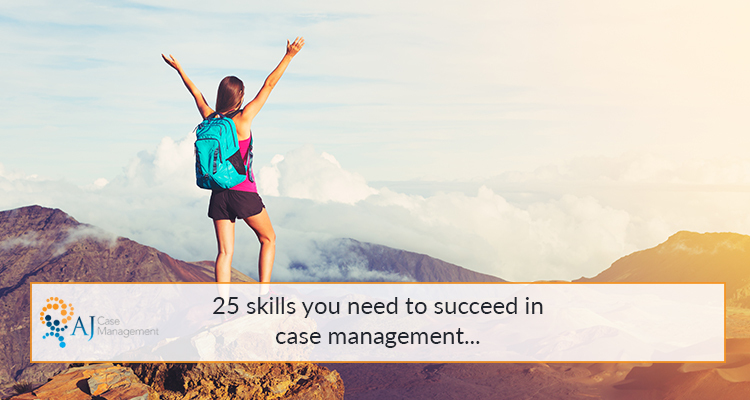 Of course, there is much more to case management than these 25 skills, such as training, qualifications, education, experience… but it’s a good place to start! These are umbrella terms, but there are plenty of skills that fall into these categories. Of course, taking on this kind of role is a big responsibility. You may be responsible for the client’s medication, therapy, rehabilitation, finance management, involvement with the community and education. Organisation is the key to handling your responsibilities. With multiple clients, rehabilitation plans, medical appointments, therapy sessions, meetings (the list goes on…) you will need to rely on your organisation in this profession. With all the duties and tasks you’ve got the responsibility of managing, delegation is a skill any successful case manager needs to learn. It can be easy to feel overwhelmed, but it’s vital not to spread yourself too thin. Always remember, quality over quantity. If you need a helping hand, make sure to delegate tasks to the appropriate team members. A big part of being a responsible case manager is having excellent time management. Turning up to appointments in plenty of time, making sure care plans have suitable time frames and allowing time for admin work all rely on this crucial skill. The final skill that showcases how responsible you are in your role – commitment. Whether this is going the extra mile for a client, team member or medical professional, your commitment to the job is an infectious trait shows how enthusiastic you are. This is sure to go a long way in case management! The dictionary defines personable as someone who is friendly, outgoing and easily able to talk to people. This is important in many client-facing roles, but it is especially significant in this industry. When you begin to work with a new client, they may be vulnerable, anxious, frustrated or frightened. There is no ‘normal’ when dealing with serious injuries, so you can’t predict how they are going to interact with you. That is why you need to enter all situations in an approachable manner, so clients feel comfortable working with you. This goes hand in hand with approachability. Displaying an unpleasant attitude will have a negative affect on anyone you work with, not just clients. An open mind and a friendly attitude will see you far in case management (a big smile helps too!). As a case managers job is to help, support and guide, a kind-hearted nature is at the core of everything we do. This helps us to make the right decisions that are truly in the client’s best interest, and not just simply going with the easiest or most direct route of rehabilitation. Who doesn’t appreciate a courteous ‘please’ and ‘thank you’? This isn’t all that this skill requires. It is about being considerate and respectful to everyone you work with, and not over stepping any boundaries. A case manager never stops learning and you must be open to gaining knowledge of new practices and techniques. By this we mean an openness to gaining understanding of new models and ways of working, but also an understanding of people. You may think we are being vague, but a deeper understanding that everyone has their own unique journey is key to succeeding in this job. You very quickly learn in this industry that there is no ‘one size fits all’, and you need to take the time to understand each and every individual. Writing accurate reports, filing client information in online systems and navigating online booking systems all require a good level of computer knowledge. You certainly don’t need to be an expert, but this knowledge is important for being efficient in your role. Knowledge of different cultures, religions, societies and ethnic backgrounds is extremely helpful for being a successful case manager. Cultural sensitivity is an important skill when working with a wide range of clients so that you are aware of their requirements or boundaries. Having good background knowledge of your clients or team members is certainly a useful skill to have in this profession. Not only this, but remembering important background knowledge and using it to tailor your care or work is the key to being a fantastic case manager. Any case manager will know that resourcefulness is the lifeline you need to get through challenging everyday tasks. ‘Having the ability to find quick and clever ways to overcome difficulties’ is the official definition and is the perfect description of this job role. You could be in a new and different environment every day. Medical facilities, client homes, therapy centres, doctors’ offices, nursing homes are some examples, just to name a few. You need the ability to adapt to different situations and environments so that you can continue to deliver support and high standard services. Although you may not realise it, this role does require a lot of creativity. It might not be in the traditional sense (we don’t write up our reports with acrylic paint), but tactical creativity is a resourceful skill we use to overcome everyday challenges. This could be finding ways to transport an immobile client, adapting someone’s job role to the requirements of their injury or sparking a young person’s interest in education again. This can sometimes go hand in hand with resourceful creativity. If you’ve created a fantastic solution that might be a little bit out of the ordinary, you may need to use appropriate persuasion skills to educate the client or team member on why it’s the best choice. Every day as a case manager you will need to use your initiative to make important decisions. You may sometimes refer with team members or other professionals, but as you develop in your career and gain more experience you will rely more on your decision-making skills. As we tell those suffering with an injury that no one should face rehabilitation on their own, the same can be said for a case manager. Working as a team is a vital part of the job and you certainly need collaborative skills to get the best out of yourself and your colleagues. When dealing with rehabilitation, medication and therapy plans you will rely heavily on your ability to communicate effectively. If your message gets misconstrued it could have serious consequences, so you always need to be certain that you are being understood clearly by team members and clients. Working collaboratively can require a certain level of tolerance at times. Whether this is with team members, clients or medical professionals, you need to be tolerant of other people’s requirements, workloads and boundaries. Although you will make many decisions by yourself to solve problems, you will also need to work as a team to find solutions to challenging tasks. A collaborative approach to problem solving isn’t something everyone is used to, but it is certainly a skill you quickly learn in case management. All of these skills will create the perfect case manager role model that others can look up to. Even with years of experience in the industry, we always recommend looking up to someone and learning from their expertise or way of working. After all, there is always room for improvement! At AJCM we have strong core values that guide us through our everyday work. Each day we strive to be better and improve our knowledge of this ever-growing industry. These 25 skills are just a small insight into our roles to give you a better understanding of what we do. If there are any skills you think we have missed, please feel free to let us know in the comments.